Thanks to Little Miss Sunshine, we know Abigail Breslin has some dance moves… kind of. But since when can she sing? Her Janie Jones co-star, Alessandro Nivola, already had some musical ability having sung in Laurel Canyon, but Breslin was going in cold. Well, as quickly as this young actress adapts from character to character is as quickly as she picked up on singing and guitar-playing because she and Nivola successfully take their performances one step further in David M. Rosenthal’s Janie Jones, creating not only compelling characters, but a fantastic soundtrack, too. Nivola plays Ethan Brand, the front man in a band whose tour is interrupted when an ex-fling decides it’s time to introduce him to his daughter, Janie Jones. When mom splits and leaves Janie behind, Ethan’s left with no choice, but to take her in and let her hit the road with the band. Trouble is, not only is Ethan incredibly uncomfortable with playing dad, but he’s harboring an alcohol problem as well. When everything boils over and he teeters on the edge of losing everything he’s worked for, the only one capable of grounding him is the loving and talented daughter he never even knew he had. 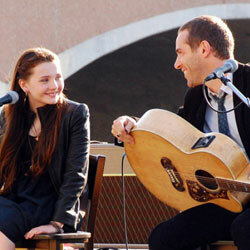 As nerve-racking as it was for Breslin to adapt to singing and playing the guitar, one of the most jarring changes was that of the actor playing her dad. Nivola stepped in just days before shooting began and only met Breslin the day before the camera rolled. (Or so they claim. It could all be CGI, couldn’t it?) Anyway, in honor of Janie Jones’ US Premiere at the Tribeca Film Festival, Nivola and Breslin sat down to tell us all about their roles, experience working together, their next projects and much more. Check it all out for yourself in the video interview below and keep an eye out for the film, which is due out in theaters and on VOD this summer. Saint has two things working against it; it’s subtitled and foreign. No, there’s nothing wrong with requiring an audience to read some text or with a film coming from another country; the problem is the subtitles are often illegible and a number of the jokes are geared towards a Dutch audience. What the rest of us end up with is a confusing and unfunny, albeit visually stimulating, horror comedy. On December 5th, 1492 a murderous saint went on a killing spree in an Amsterdam village. While many lives were lost, the townsfolk got their revenge, burning Saint Nick to death by setting fire to his boat. However, their immediate victory turned into a long-term nightmare with Saint Nick vowing to return on the anniversary of his death when the moon is full on Christmas. Fast forward to present time when the tale of Saint Nick is a mere urban legend. When the innocent myth turns into a gruesome reality for a group of teens, they’re left helpless, nobody believing that the curse is true and Saint Nick indeed returns to town every 32 years to claim the lives of as many people as possible with the help of his evil Black Peters. We all know Olivia Wilde for her work on House, the monster hit Tron: Legacy as well as a slew of other noteworthy films, but what’s the actress up to when she’s not in front of the camera? 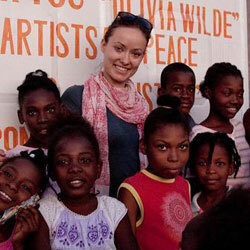 Ever since last year’s earthquake, Wilde donates a significant amount of her time to working with an organization called Artists for Peace and Justice in an effort to restore Haiti’s hospitals, schools and orphanages. Even while she’s helping get these essentials back up and running, though, she wants to make sure they have a source of entertainment as well. After the quake took down the last of Haiti’s functioning movie theaters, aide workers David Darg and Bryn Mooser decided to enlist in the help of the local citizens to create a new one, the Sun City Picture House; as they put the theater together they also made a short film about it, and that’s where Wilde stepped in. Wilde and Maria Bello served as Sun City Picture House’s executive producers doing everything and anything they could to not only assist in the production of this short film, but in the completion and preservation of the Sun City Picture House, too. Wilde calls Sun City Picture House “my proudest moment in my career.” Hear all about her experience working on this production from Wilde herself in the video interview below. When you specifically take note of a fly landing on a rice krispy treat, you know a film is lacking big time. Well, that rice krispy treat sat on a buffet table at a party in the movie Prom and the thought of a student eating that tainted treat was the most emotionally stimulating point of the film. Think that was intentional? Who’s ready for that magical time of year, Prom? Well, these students are – kind of. It’s just about time for the big night and the occasion has these kids stressed out to the max. First, there’s Nova (Aimee Teegarden), the quintessential perfect student. On top of getting excellent grades and having a great reputation, Nova also heads up the prom committee. Everything is going swimmingly until someone accidently ignites the prom decorations. When Nova’s prom committee refuses to donate more time to rebuild, Principal Dunnan (Jere Burns) assigns the school bad boy, Jesse (Thomas McDonell), to help out despite both his and Nova’s resistance. Meanwhile, hotshot jock Tyler (DeVaughn Nixon) is juggling two ladies, his long-time girlfriend, Jordan (Kylie Bunbury), and sophomore Simone (Danielle Campbell). While Simone is tempted to be with the big man on campus, she’s also developing feelings for a nerd her own age, Lucas (Nolan Sotillo). Lucas is thrilled to get some attention from his crush, but when he starts to neglect his best buddy, Corey (Cameron Monaghan), it causes a rift in their friendship. Mei is also struggling with the decision of weather or not to attend her dream school, Parsons, or to push that aside to follow her boyfriend, Justin (Jared Kusnitz), to Michigan. Then there’s Rolo, who, well, eats Rolos and takes supermodels to prom. Autism is a tough topic to tackle on film. Not only do you run the risk of upsetting folks by misrepresenting the condition, but if you take it too far, drowning the viewers in the severity of the disorder, the film loses its entertainment value. Well, writer-director Janet Grillo has found a happy medium and that makes her first feature film, Fly Away, not only an honest and moving telling, but an enjoyable one, too. The film stars Beth Broderick as Jeanne, the mother of an autistic child, Mandy (Ashley Rickards). Not only must Jeanne raise Mandy on her own, but ensure she’s getting the proper clinical attention and treatment, all while making a living. While Beth has managed over the years despite the absence of Mandy’s father, now that Mandy is reaching adulthood, she’s becoming tougher to control and Jeanne’s life begins to unravel. Fly Away doesn’t side skirt the issue in the least. Mandy does have a rather severe case of autism and Grillo doesn’t hold back when it comes to showing how that effects Beth’s life at home, in public and at work. Yes, it can be tough to watch, but with Grillo’s understanding touch, Beth and Mandy’s story becomes a piece that’s not only extremely telling, but heartwarming as well. 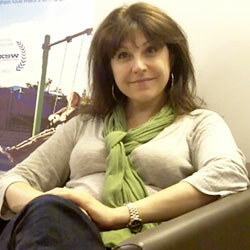 Grillo’s had experience making short films, but Fly Away marks her feature debut. While it was quite the leap, thanks to her prior work, Grillo had a team dedicated to making a great film that would bring Grillo’s story to life in the most poignant way possible. Hear all about Grillo’s process making this film from deriving the story from her own personal experiences, to working with her cast, her hopes for the film now that it’s reached the public and so much more. Check it all out in the video interview below and be sure to catch Fly Away in theaters and on DVD now. Yes, we want our horror films to be scary, but being too scary is a major genre pitfall. Often this stems from a film being exploitative and dousing us in incredibly gory or disturbing visuals, but sometimes we get the beautiful juxtaposition of a film being so well done that it feels too real. What can be more genuinely horrifying than that? Jaime, Marta (Fernando Cayo and Ana Wagener) and their daughter, Isa (Manue;a Vellés), move into a gorgeous new home. Marta wants to have a family dinner to celebrate, but like most young girls, Isa would rather spend the night out at a party with her boyfriend, César (Xoel Yáñez). Mom won’t budge, but when daddy’s little girl asks her father, she gets her way. Of course, this upsets Marta who pleads with Jaime that they both be on the same side of these issues. Well, none of that matters anyway because before Isa can even finish getting ready for her big night out, a trio of masked men break into their beautiful new abode and take the family hostage. Jaime is forced to ride with one of the intruders around town collecting money from various ATMs while his wife and daughter remain at home with the other two assailants. The deal is, if Jaime cooperates and gets the men their money, his family will be spared. Think you’re a found footage expert having seen everything from The Blair Witch Project to Paranormal Activity? Well, this might blow you away; not only does this year’s Tribeca Film Festival boast two fictional found footage-style films, but a non-fiction one, too! It’s a documentary called The Miners’ Hymns. Director Bill Morrison is known for using shots bearing signs of chemical deterioration, further enhancing the decay through digital processing, but here, he uses pristine black and white material from the British National Archives as well as some gorgeous freshly shot color footage. 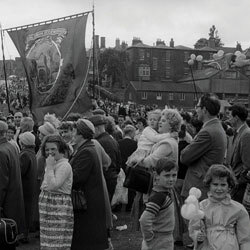 Morrison combined the two in his effort to reconstruct the history of coal mining in Durham, England, including the miners’ strike of 1984. A documentary with zero dialogue, talking heads or narration, The Miners’ Hymns relies solely on Morrison’s construction and Jóhann Jóhannsson’s score to express a narrative. In time with The Miners’ Hymns premiere at the Tribeca Film Festival both Morrison and the film’s producer, David Metcalfe, sat down to tell us about the production of the film beginning with Metcalfe approaching Morrison about making the film to Morrison having to create imagery to accompany Jóhannsson’s music and more. Hear it all for yourself in the video interview below.